With Delhi experiencing one of the coldest winters in recent memory, the members of Ayudh Delhi decided to stretch out a helping hand to the homeless those who are having to brace the biting cold in the open. They organized a blanket distribution program for the children of these families. The first site identified for this endeavor was the ‘Coolie Camp’ (in Vasant Vihar). 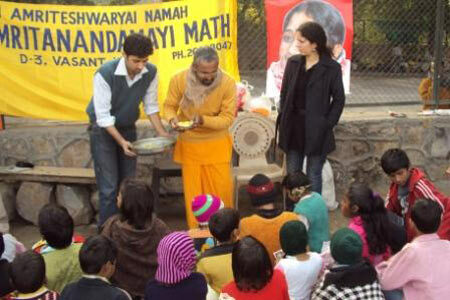 On the auspicious day of Makar Sankranti, the Ayudh group under the guidance of Br. Vijayamrita Chaitanya, reached the place and were greeted by a group of eager faces. As they introduced themselves, we were touched by their innocence and their receptivity even when circumstances have not been the best for them. Their loving welcome and their eagerness to show their love and appreciation touched us all. Blankets were distributed to all of them. When we asked them what they wanted, they asked for us to take them to take them on a visit to the zoo… of course, we were all too happy to promise them the excursion.